Calculator for the maximum number of photovoltaic modules, which can be installed on a surface of a certain size. Enter the size of a rectangular surface, which should be covered with photovoltaic modules (possibly you have to consider a margin), and the size of a module. If the surface has a different shape or has gaps (e.g. roof-lights), then you have to split it into single rectangles, which can be calculated individually. For the surface and the modules, please enter values with the length larger than the width. It will be calculated, how many modules orientated along and how many across fit on the surface, as well as the size of the spare area. At the orientation along, the long sides of the modules are parallel to the long side of the surface, at the orientation across, they are perpendicular. Sometimes the one orientation is more effective, sometimes the other. More common is the orientation across. 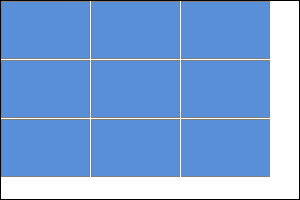 In the following example, along has 9 modules, across has 10. The spare area has an L-shape. This calculator is for the estimation of the possible number of photovoltaic modules on a certain surface. The exact number and construction have to be planned by specialists. Here you can convert area units.